At GigMasters we are all about making it as easy as possible for our clients to find and book the perfect entertainment for their events. Searching GigMasters is easy but we are always looking for ways to make it even simpler. There's more than one way to skin a cat (what a weird saying) and there is way more than one way to search GigMasters. 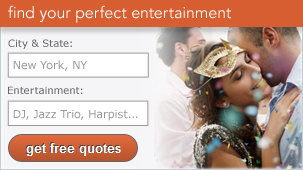 In fact, there are a lot of ways to find great entertainment on GigMasters. Of course there is the search box on our homepage, www.gigmasters.com and on all of our interior pages. A few months ago we introduced a little something we like to call Quick Quotes. That's for the client on the go. If a client visits GigMasters on their phone or mobile device, they'll use our mobile search to find entertainment. We've already told you about Full Text Search and the Portable Contact Form, which lets clients book you via GigMasters while never leaving your personal website. 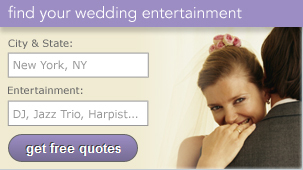 Now we have a new way to search GigMasters - right from our Party and Wedding blogs. If you are a regular Inside the Gig reader, you know that we are pretty active bloggers. It's a great way to connect with you our members, but also new clients. Thousands of visitors come to our blogs each week and now they can start their entertainment search from any of our blog pages.